The program will explore “Music for War and Peace.” The featured work is Kurt Weill’s rarely heard 1928 cantata “Das Berliner Requiem” for three male voices and wind orchestra, based on poems by Bertolt Brecht. The soloists are tenor Matt Morgan, baritone Jay Ivey and bass Anthony Offerle. The work was commissioned by the Frankfurt Radio and the poems were selected by Weill in memory of the 10th anniversaries of two related events: the end of World War I and the murder of pacifist leader Rosa Luxemburg by officers of a paramilitary right-wing organization. The Wind Ensemble has collaborated with students from two JU photography classes, led by Associate Professor Ginger Sheridan, to create photographs that reflect the music for war and peace heard in the concert. These photographs will be displayed in the lobby of Terry Hall during the event. Attendees will have a chance to meet the artists who produced these works. The concert will also feature a celebrated work by Czech composer Karel Husa, “Music for Prague 1968,” a programmatic work based on the Soviet invasion of Czechoslovakia. The music vividly describes emotional images of the Czech people: calls of distress, acts of resistance, sounds of tragedy and hope, and symbols of liberty. This powerful work has received thousands of performances since its premiere in 1969. 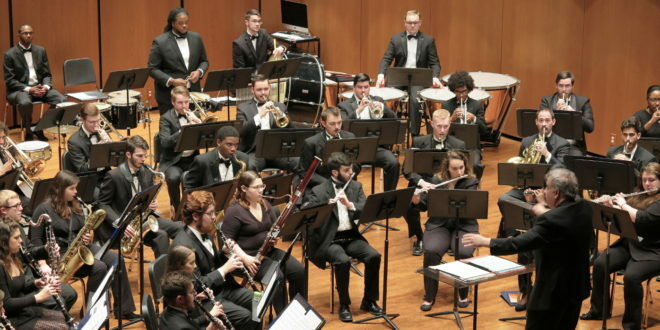 The JU Wind Ensemble, directed by Artie Clifton, JU Associate Professor of Music in the College of Fine Arts, is a 50-member group of wind and percussion players who study and perform music from the traditional and contemporary wind band literature. The concert on the JU campus at 2800 University Blvd. N. is free to the public. For more information, contact Artie Clifton at (904) 256-7386, aclifto@ju.edu. “Confluence” is the name of JU’s new “themed semester” integrative learning initiative. Beginning with the pilot academic year 2017-18, each “themed” fall term will feature a variety of curricular and co-curricular components originating from a range of units across campus, each of which will directly connect to the designated “theme” for the semester. The inaugural Confluence theme, “War and Peace,” is designed to stimulate and encompass the consideration of a number of related questions and issues.